Origami artist Linda Stephen, Lincoln, Nebraska, recently shared several advance copies of DC Super Heroes Origami written by origami master John Montroll with me and the Origami Salami and Folding for Good network. DC Super Heroes Origami, published by Capstone Young Readers, is due out in September 2015, and is showcased this week in New York City at Book Expo America. I am giving one away through my Origami Salami Facebook community page, so you can enter to win one just for “liking” my Origami Salami Facebook page and sharing a photo album about the book to your Facebook page. The album is found here. I shared a few advance copies with Origami Salami leadership. 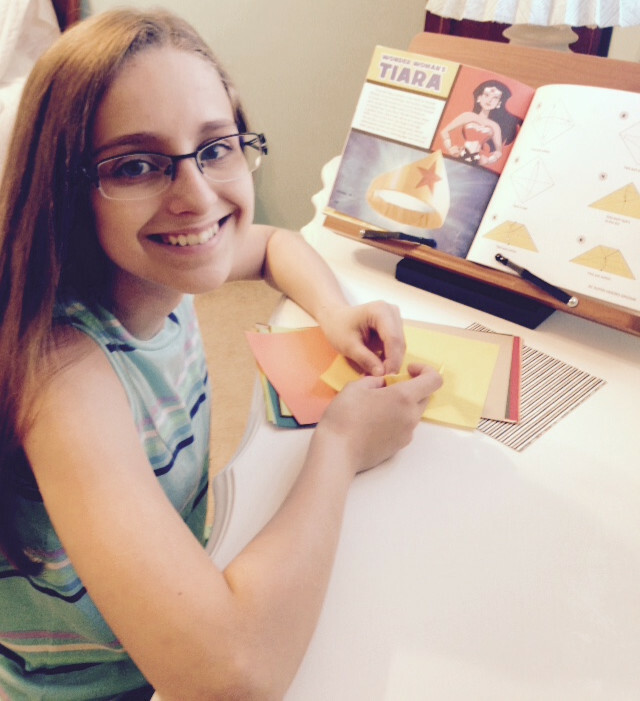 Here is a brief book review written by Mia Fantozzi, Origami Salami East Pittsburgh. Mia Fantozzi, Origami Salami East Pittsburgh, practice folds the Tiara of Wonder Woman. 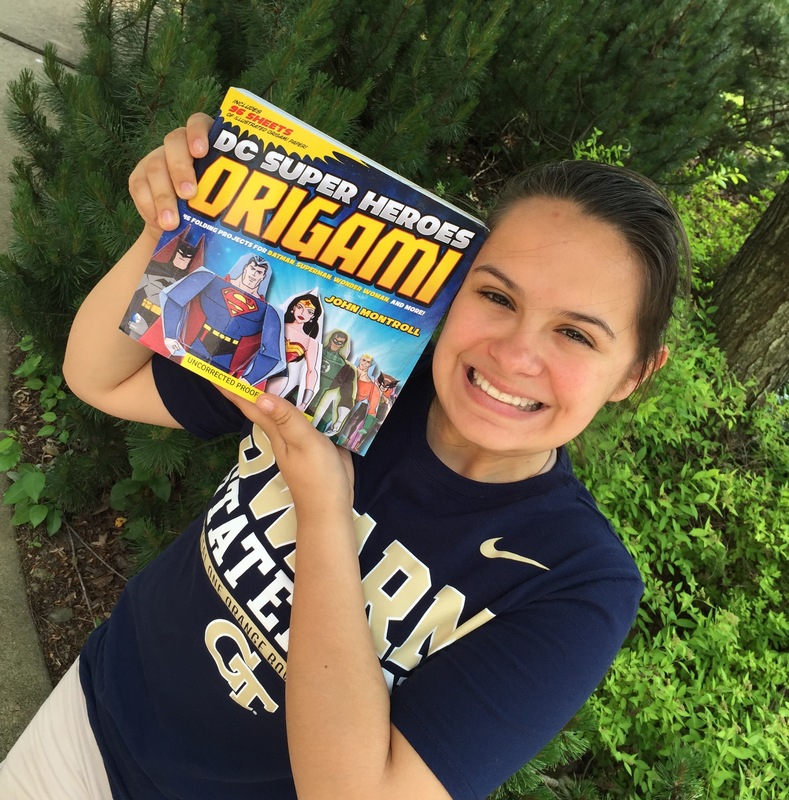 Calista Frederick-Jaskiewicz shows off an advance copy of “DC Super Heroes Origami” by John Montroll. As for me, John Montroll authored one of my favorite origami books, Animal Adventure Origami, and I mentioned it in an interview with Dana Hinders of About.com/origami several years ago. Like earlier books, his instructions in DC Super Heroes Origami are easy to follow and fun to produce. DC Super Heroes Origami is a thick, colorful, engaging book. It contains 96 custom sheets of paper. Each sheet has an orientation arrow so that you’ll know exactly how to start—pay attention to the Paper User Guide. I suggest practicing on other, plain paper before using the published designs. This is DC Comics origami, math you can hold in your hand, and a lot of fun. This entry was posted in Art, Math, Origami, Origami Salami, STEM and tagged About.com/origami by Dana Hinders, Book Expo America 2015, Calista Frederick-Jaskiewicz CEO Origami Salami and Folding for Good, Capstone Young Readers, DC Super Heroes Origami, Giveaway, John Montroll, Linda Stephen, Mia Fantozzi, Origami Salami East Pittsburgh.